Winter Magic 2017! Tee Shirt and/or Mug Available at Teespring.com If you plan to buy, please do so soon because this campaign will be ending. 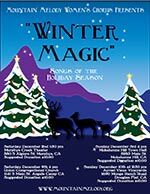 Many old favorites such as “The Winter Waltz” and “Winter Wonderland of Snow” will take you back in time for an old fashioned family Christmas. “Winter’s Waking” and “My Soul is Awakened” offer a contemporary and stirring vision of the winter season. Other tunes such as “The Swingin’ Shepherd Blues” and “Hotta Chocolatta” bring a swinging vibe into the mix and will surely have you tapping your toes!